The Rimac C-Two is set to become the most powerful and technologically advanced electric hypercar on earth. With a combined output of 1,914 hp and 1,696 lb-ft of torque, the car is capable of sprinting from 0-62 mph in a staggering 1.85 seconds, making it faster off the line than the Tesla Roadster, and a top speed of 258 mph. But achieving this phenomenal performance while meeting homologation requirements proved to be a huge challenge for Rimac. Development of the C_Two started two years ago. 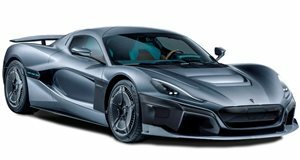 Nothing has been carried over from the original Concept_One, which meant Rimac had to overcome all sorts of challenges to make it even faster than its predecessor. The internal aerodynamics team started the development based on early design concepts, developing from a closed body in 2D, moving to the 3D analysis, using CFD (Computational Fluid Dynamic) simulations. Rimac changed the balance of the aerodynamics on the car with a new active rear wing, active rear diffuser, front intake and an adjustable blade in the hood. Initial tests carried over on a supercomputer at the University of Rijeka. Rimac says the C_Two had to go through "70 million elements and complex equations." A full-sized model was then tested in a wind tunnel featuring functional active aero components, realistic suspension and brakes, fans, realistic pressure drop across the radiator cores and rotating wheels to test the car extensively before production. Wind tunnel testing was split into different sessions focusing on the car’s drag coefficient, lift coefficient, and cooling efficiency. Impressively, the average deviation between the computer simulation and wind tunnel testing for drag coefficient was only 2.4 percent, which is amazingly accurate. Now that wind tunnel testing is complete, the C_Two will soon be taking a trip to the track for some real-world testing.